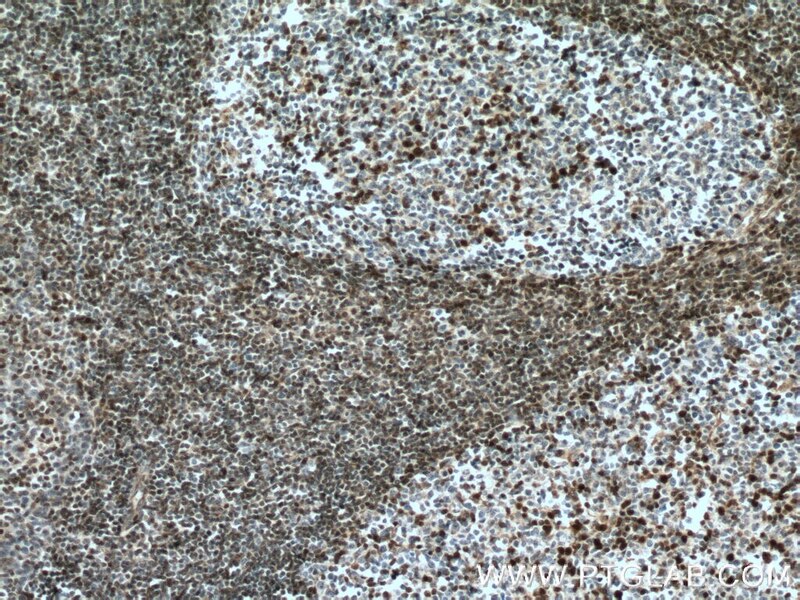 Immunohistochemical analysis of paraffin-embedded human gliomas tissue slide using 26714-1-AP( P27; KIP1 Antibody) at dilution of 1:400 (under 10x lens). heat mediated antigen retrieved with Tris-EDTA buffer(pH9). 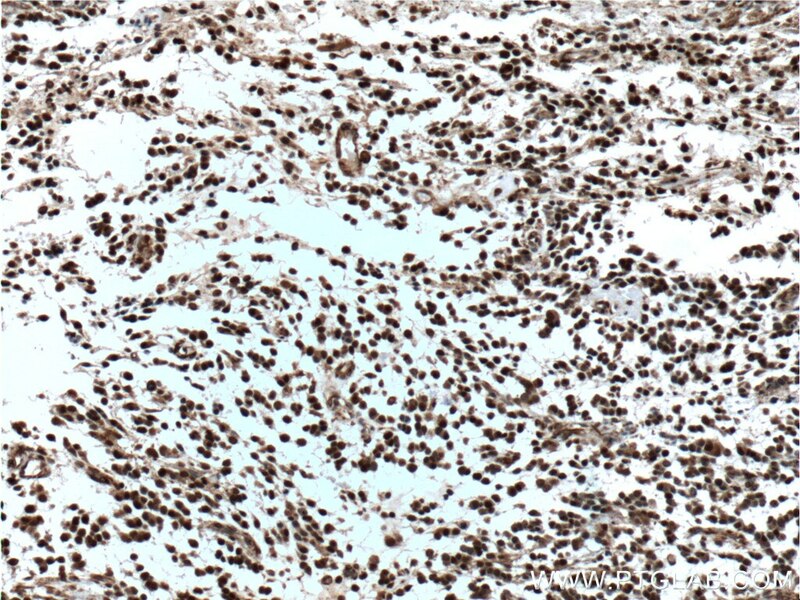 Immunohistochemical analysis of paraffin-embedded human gliomas tissue slide using 26714-1-AP( P27; KIP1 Antibody) at dilution of 1:400 (under 40x lens). heat mediated antigen retrieved with Tris-EDTA buffer(pH9). CDKN1B, also named as P27 or KIP1, is a cyclin-dependent kinase inhibitor, which shares a limited similarity with CDK inhibitor CDKN1A/p21. 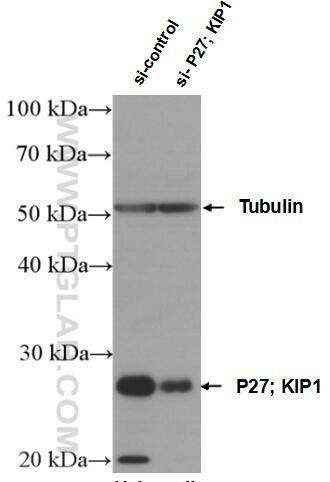 P27 binds to and prevents the activation of cyclin E-CDK2 or cyclin D-CDK4 complexes, and thus controlling cell cycle progression at G1. 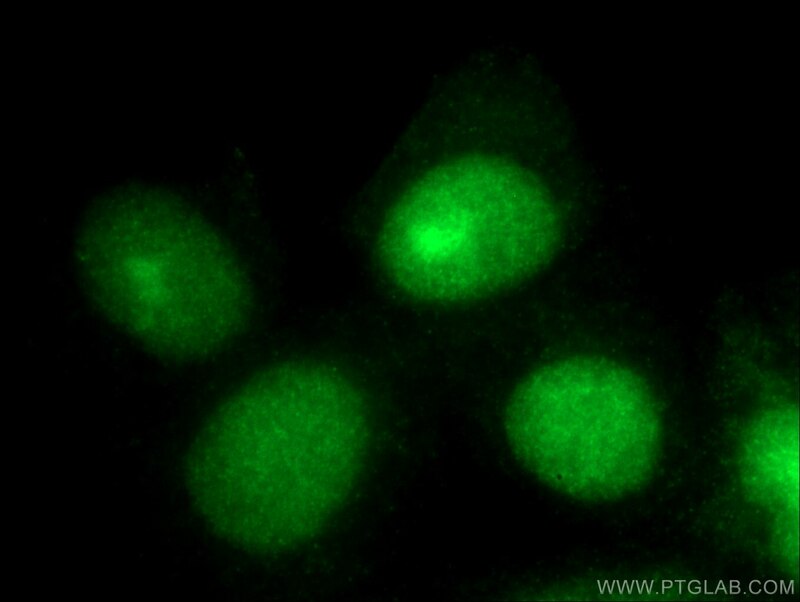 The degradation of this protein, which is triggered by its CDK dependent phosphorylation and subsequent ubiquitination by SCF complexes, is required for the cellular transition from quiescence to the proliferative state. 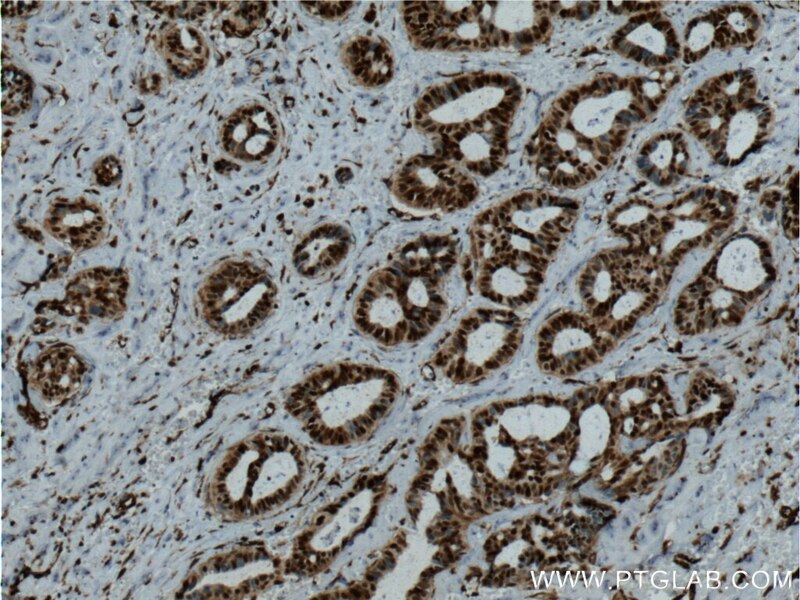 Downregulation of P27 has been implicated in the progression of several malignancies, including lung cancer, hepatocellular carcinoma, salivary cancer, oral squamous cell carcinomas, and gastric cancer. Effects of three-dimensional collagen scaffolds on the expression profiles and biological functions of glioma cells. 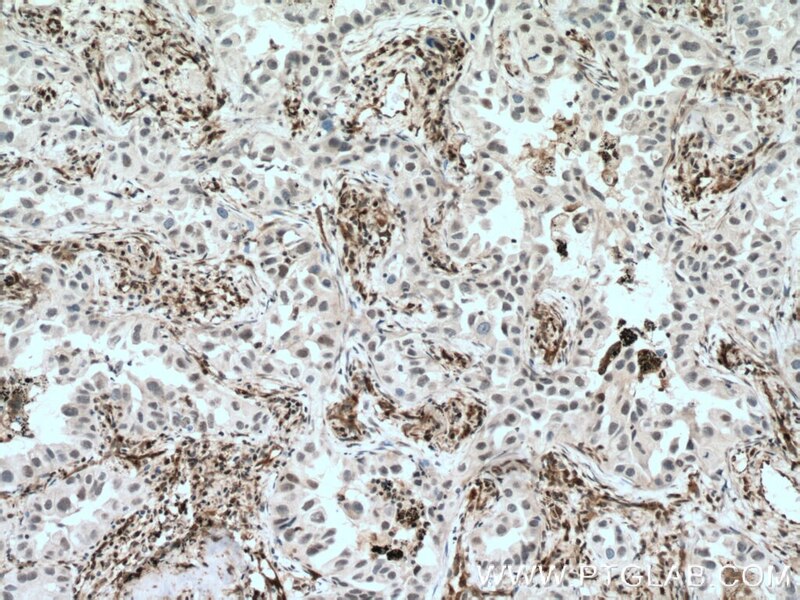 Immunohistochemical analysis of paraffin-embedded human breast cancer tissue slide using 26714-1-AP( P27; KIP1 Antibody) at dilution of 1:400 (under 10x lens). heat mediated antigen retrieved with Tris-EDTA buffer(pH9). 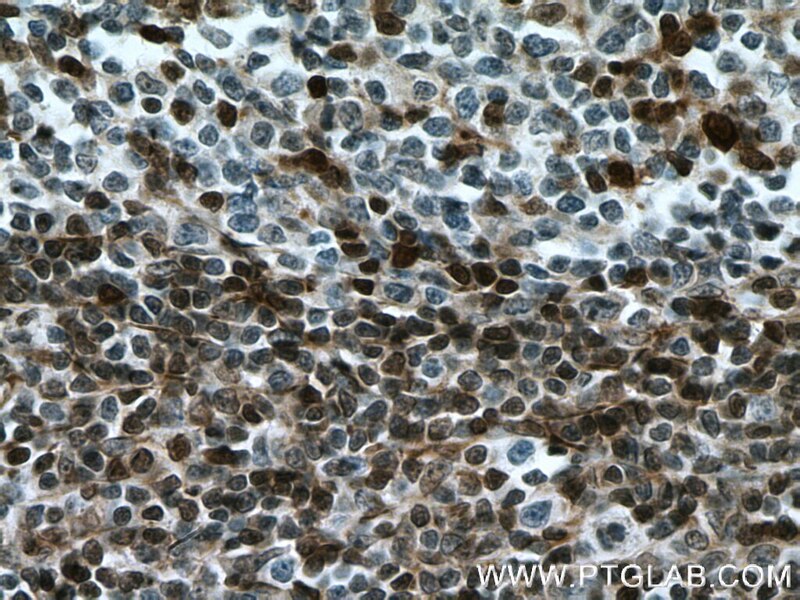 Immunohistochemical analysis of paraffin-embedded human breast cancer tissue slide using 26714-1-AP( P27; KIP1 Antibody) at dilution of 1:400 (under 40x lens). heat mediated antigen retrieved with Tris-EDTA buffer(pH9). 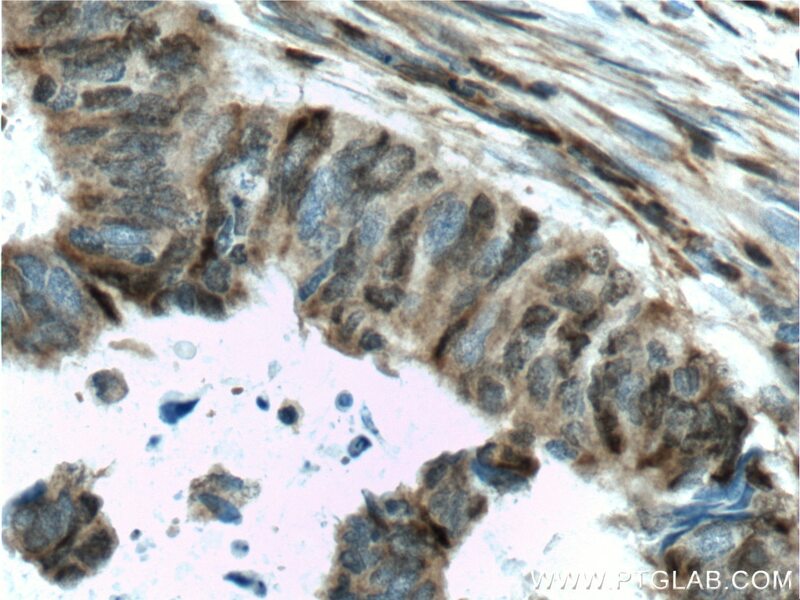 Immunohistochemical analysis of paraffin-embedded human colon cancer tissue slide using 26714-1-AP( P27; KIP1 Antibody) at dilution of 1:200 (under 10x lens). heat mediated antigen retrieved with Tris-EDTA buffer(pH9). 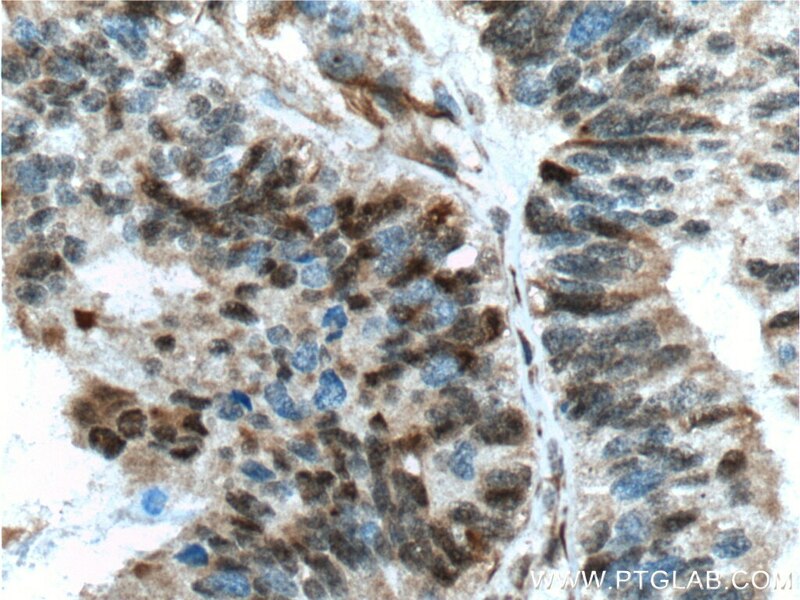 Immunohistochemical analysis of paraffin-embedded human colon cancer tissue slide using 26714-1-AP( P27; KIP1 Antibody) at dilution of 1:200 (under 40x lens). heat mediated antigen retrieved with Tris-EDTA buffer(pH9). 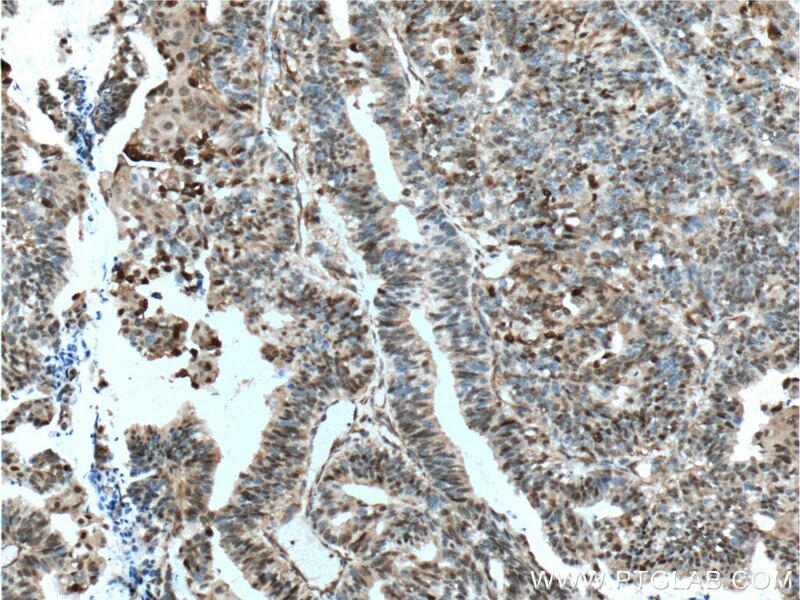 Immunohistochemical analysis of paraffin-embedded human lung cancer tissue slide using 26714-1-AP( P27; KIP1 antibody) at dilution of 1:400 (under 10x lens) heat mediated antigen retrieved with Tris-EDTA buffer(pH9). 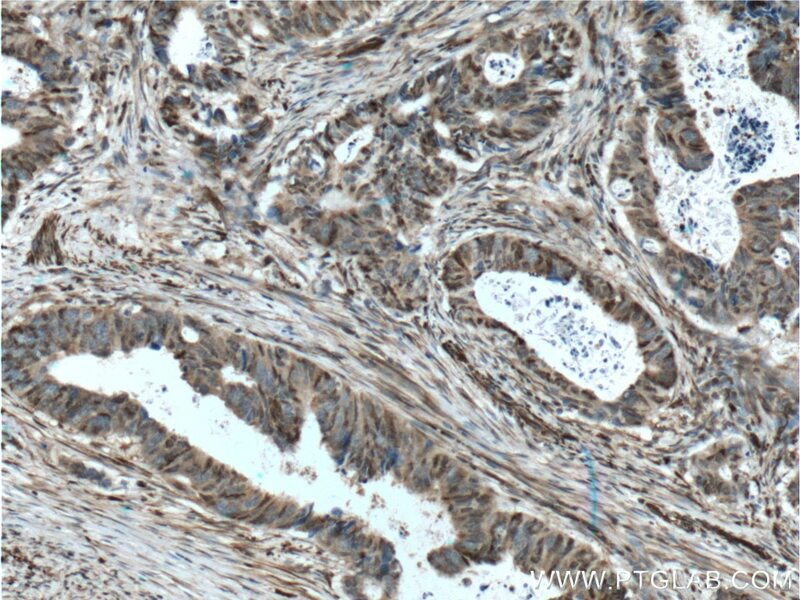 Immunohistochemical analysis of paraffin-embedded human lung cancer tissue slide using 26714-1-AP( P27; KIP1 antibody) at dilution of 1:400 (under 40x lens) heat mediated antigen retrieved with Tris-EDTA buffer(pH9). 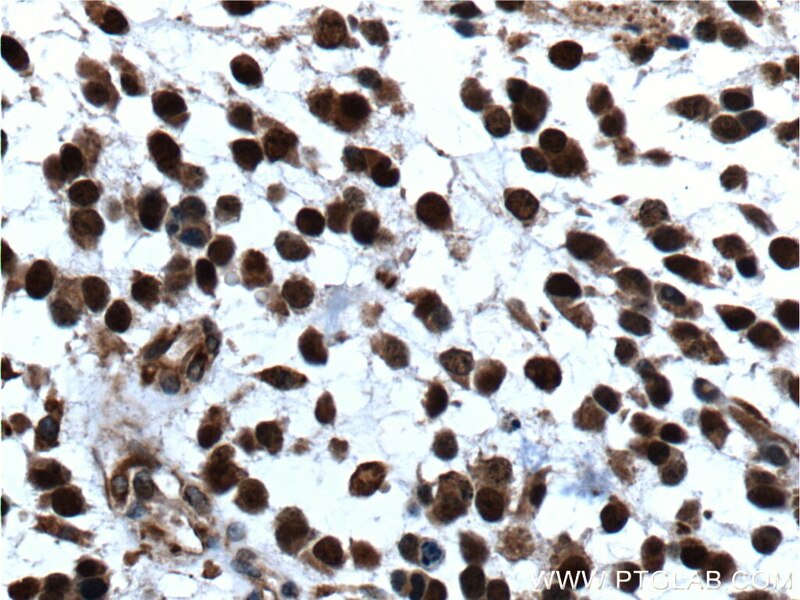 Immunohistochemical analysis of paraffin-embedded human ovary tumor tissue slide using 26714-1-AP( P27; KIP1 Antibody) at dilution of 1:200 (under 10x lens). heat mediated antigen retrieved with Tris-EDTA buffer(pH9). 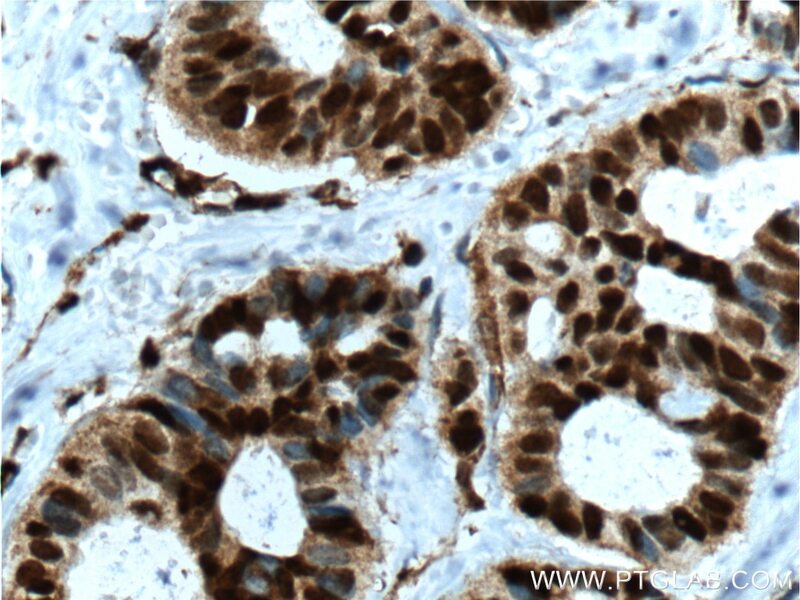 Immunohistochemical analysis of paraffin-embedded human ovary tumor tissue slide using 26714-1-AP( P27; KIP1 Antibody) at dilution of 1:200 (under 40x lens). heat mediated antigen retrieved with Tris-EDTA buffer(pH9). Immunohistochemical analysis of paraffin-embedded human tonsillitis tissue slide using 26714-1-AP( P27; KIP1 antibody) at dilution of 1:400 (under 10x lens) heat mediated antigen retrieved with Tris-EDTA buffer(pH9). 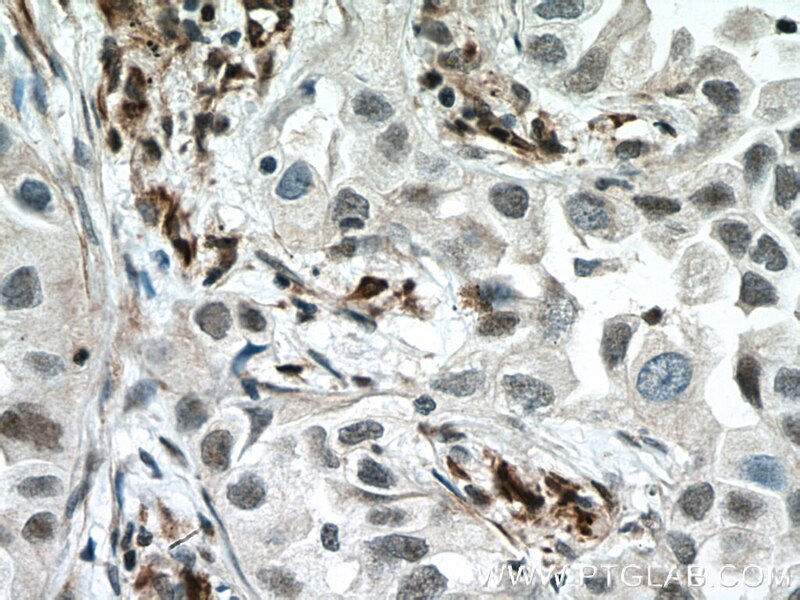 Immunohistochemical analysis of paraffin-embedded human tonsillitis tissue slide using 26714-1-AP( P27; KIP1 antibody) at dilution of 1:400 (under 40x lens) heat mediated antigen retrieved with Tris-EDTA buffer(pH9).